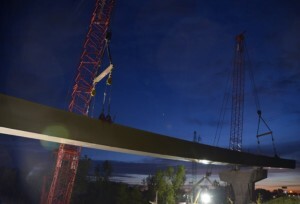 Four Manitowoc 2250 crawler cranes were featured prominently in the assembly of several new overpass bridges as part of a $61 million highway project in Wisconsin. The work also included the expansion of highway U.S. 41 traffic lanes, the reconstruction of several of its interchanges and the addition of 40 roundabouts. Dawes Rigging & Crane Rental of Milwaukee handled the lifting work. The cranes’ 330-foot main booms were crucial to the lifts, raising loads above and across several traffic lanes and other road construction equipment to carefully position them on concrete support piers. The 2250s also endured shifting seasons to complete the project, ranging from heavy snow in February to excessive heat in July.